US soccer writer Michael Lewis, editor of BigAppleSoccer.com gives his take on the US 1-1 tie with Italy in Kaiserslautern, Germany Saturday to keep their hopes alive. To advance into the next round, the U.S. must defeat the Africans and hope Italy beats the Czechs. If the Czechs prevail, then it becomes a goal-differential battle between the Americans and Italians. Kaiserslautern, Germany — One by one the U.S. players fell to the turf at Fritz-Walter Stadion exhausted, having just played the game of their lives after saving their collective World Cup lives. The U.S. survived two red cards, including playing a man down for nearly half the match, in an epic 1-1 draw with Italy last night. 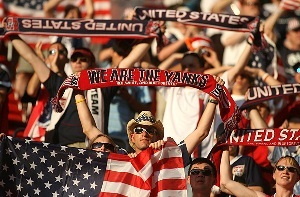 It remains to be seen whether the tie will help boost the Americans into the second round, but they still have a chance. Entering Thursday’s Group E confrontation with Ghana, stunning 2-0 winners over the Czech Republic earlier in the day, in Nuremberg Thursday. Italy (1-0-1, four points) leads the group, followed by Ghana (1-1-0, three), Czechs (1-1-0, three) and the U.S. (0-1-1, one). It was the first time the U.S. recorded a point in nine World Cup matches played in Europe. To advance, the U.S. must defeat the Africans and hope Italy beats the Czechs. If the Czechs prevail, then it becomes a goal-differential battle between the Americans and Italians. In contrast to the U.S.’s lackluster effort in the abysmal 3-0 loss to the Czechs on Monday, the U.S. played with much more spirit, heart and intensity. Uruguayan referee Jorge Larrionda handed out three red cards and four yellow cards. Three red cards — only the fourth time in Cup history that occurred during a match — changed the complexion of the match before a capacity crowd of 46,000. Defensive midfielder Pablo Mastroeni fouled Francesco Totti 23 yards out on the right side. Andrea Pirlo sent a free kick toward the near side that Alberto Gilardino, who shook loose from his man, former MetroStars defender Eddie Pope, and headed the ball from five yards past goalkeeper Kasey Keller. As the play commenced, Pope held up his arm, signifying an infraction as Gilardino bolted past him. Then, within an amazing 59-second span the Italians self-destructed. After an Italy foul on the right flank of the penalty area, a free kick toward the far end of the box was sent into the area. It traveled over the heads of forward Brian McBride and defender Carlos Bocanegra. However, Italian defender Christian Zaccardo incredibly tapped the ball into his own net from six yards for a 1-1 tie. Barely less than a minute later the Italians pulled off yet another blunder when midfielder Danielle DeRossi was red-carded for elbowing McBride in the head while leaping for a ball at midfield. McBride, who was bleeding under his left eye, was forced from action for several minutes. But he returned with a band-aid under the eye. That gave the U.S. a short-lived one-man advantage before the Americans got a red card of their own. Mastroeni saw red from Larrionda for a hard midfield tackle on Pirlo in the 45th minute. The U.S. had another player ejected in the 47th minute as former MetroStars defender Eddie Pope was slapped with his second yellow card for fouling Gilardino from behind and was red-carded. “Two red cards in a span of five minutes is pretty harsh,” Arena said. Instead of folding, the U.S. showed determination and continued to attack in spots while holding off the Italians. In fact, the U.S. came close to scoring the game-winner in the 65th minute when second-half sub DaMarcus Beasley put the ball into the back of the net. The goal was called back due to offside. Arena used a 4-3-1 formation, bringing on Conrad for Convey and Beasley for Clint Dempsey. “If we can do that with nine men, we can beat everybody with 11,” Donovan said. Gianluigi Buffon; Cristian Zaccardo (Alessandro Del Piero-53), Fabio Cannavaro, Alessandro Nesta, Carlos Zambrotta; Daniele De Rossi, Francesco Totti (Gennaro Gattuso-34), Simone Perrotta, Andrea Pirlo; Luca Toni (Vincenzo Iaquinta-60), Alberto Gilardino. Kasey Keller; Carlos Bocanegra, Pablo Mastroeni, Steve Cherundolo, Oguchi Onyewu, Eddie Pope; Clint Dempsey (DaMarcus Beasley-61), Claudio Reyna, Bobby Convey (Jimmy Conrad-51), Landon Donovan; Brian McBride.